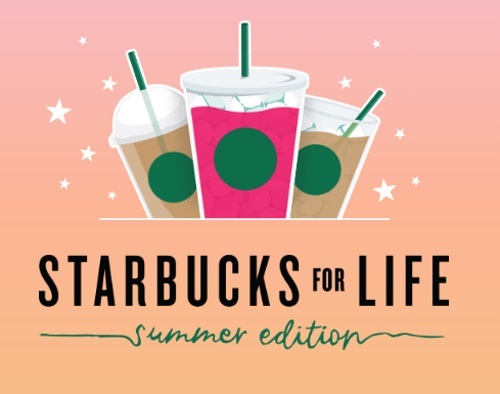 Starbucks has brought back their Starbucks for Life contest for the summer! Play for a chance to win Starbucks for a week, month, a year, or life, plus a share of millions of stars up for grabs! 1.When you make a purchase with your Starbucks app or registered card, you'll earn a game piece just make sure your card's loaded so you don't miss a play. 2. Log in to get your game piece and add it to your board, or see if you got an instant win. 3. Keep playing to collect the three game pieces you need to win Starbucks for a week, month, year or life. Also, get a bonus play when you spend $10 or more. No purchase necessary (click here to enter that way). Limit of 4 game plays per day. Contest excludes Quebec. Contest ends September 12, 2016. Click here to play the contest.